Present value calculator is a tool that helps you estimate current value of a future payment or a stream of cash flows given a certain rate of return. Present value, also called present discounted value, is one of the most important financial concepts and is used to price among other things mortgages, loans, bonds, stocks and more, just as future value calculations. It's related to the fact that money we receive today can be invested to earn a return. It is also useful when estimating how much you need to invest now in order to meet a certain future goal, for example buying a car or a home. So, if you're wondering how much your future earnings are worth today keep reading to find out how to calculate present value. You could also be interested in future value calculator. Keep reading to find out how to work out present value and what's the equation for it. Where: n = number of periods. This is the most commonly used present valuation model where compound interest is applied, which means that interest increases exponentially over subsequent periods. Determine the future value. In our example let's make it $100. Determine a periodic rate of interest. Let's say 8%. Determine the number of periods. Let's make it 2 years. Now you know how to estimate the present value of you're future incomes on your own or you can simply use our present value calculator. Present value calculations are tied closely with other formulas, such as present value of annuity. Annuity denotes a series of equal payments or receipts, which we have to pay at even intervals, for example rental payments or loans. Than the equation would be different. 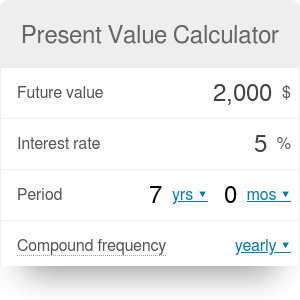 Click through to our present value of annuity calculator to learn more. Present Value Calculator can be embedded on your website to enrich the content you wrote and make it easier for your visitors to understand your message.